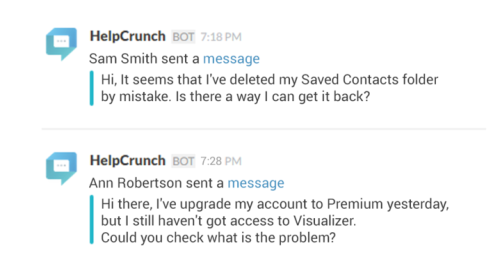 Update: HelpCrunch is in Slack store now that makes integration super easy – literally in one click right from your HelpCrunch admin account! HelpCrunch is happy to announce that Slack integration is finally available. Here is a step-by-step guide on Slack integration. It takes literally only few minutes! Set up a new communication channel in Slack. If you are managing few apps, set up separate channels for different apps to provide transparent view of what’s going on within each mobile application and help your team manage HelpCrunch notifications efficiently. Generate WebHook URL from Slack. 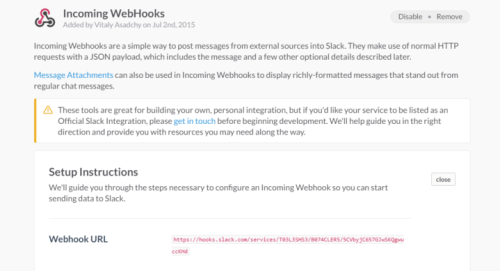 Simply go to your Slack account settings, choose Integrations and select Incoming WebHooks from the list. Once you open Incoming WebHooks select the right Slack channel where you wish to receive notifications and press Add Incoming WebHooks integration to gererate WebHook URL. Link HelpCrunch with Slack. Go to your HelpCrunch account Settings and choose a mobile application you wish to connect with previously selected Slack channel. 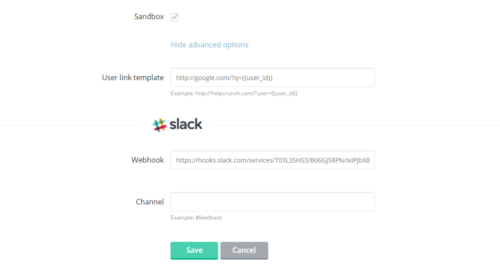 Choose Show Advanced Option to find the field to paste WebHook URL from Slack. Voila! Now every time your app user sends you a message, HelpCrunch would send an alert in a designated Slack channel. You team would immediately see the user name together with message content and decide who is the best to manage user request (tech engineer, marketer, sales person, etc.). We hope that with Slack integration, HelpCrunch would fit perfectly into your business workflow and would make customer communication process as efficient as possible. Let us know if you wish to see more tools to be integrated with HelpCrunch. Share your thoughts with our team by sending a quick message to us.